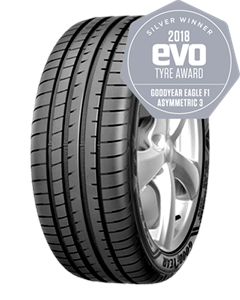 The New performance tyre that delivers you shorter braking distances on wet and dry roads so that you are in control and ready to enjoy the journey. With Active Braking Technology, the contact surface and grip increases when braking. This increased contact with the ground provides you with shorter braking distances on wet and dry roads. The New Grip Booster compound used for the Eagle F1 Asymemtric 3, is made with adhesive resin to increase stickiness with the surface. This delivers better grip for braking and handling on wet and dry roads. New Reinforced Construction Technology delivers a stronger lightweight contruction improving handling, cornering performance, tread wear and fuel efficiency. Excellent service been coming here since 2001 and wouldn't think of using anyone else Extremely knowledgeable and nothing is to much trouble . Great service good value friendly staff.